NEW ORLEANS, Louisiana, November 15, 2012 (ENS) – Oil giant BP has agreed to pay the U.S. government more than $4 billion to settle criminal charges stemming from the 2010 oil spill in the Gulf of Mexico. Today in New Orleans the Justice Department charged BP with 14 criminal actions including, 11 counts of felony manslaughter, one count of felony obstruction of Congress, and violations of the Clean Water and Migratory Bird Treaty Acts in connection with the Deepwater Horizon oil spill that began in April 2010. On April 20, BP’s Macondo well blew out, engulfing the Deepwater Horizon oil rig in flames and spewing nearly five million barrels of oil into the Gulf over three months until the well, about 40 miles southeast of the Mississippi Delta, was finally capped. BP has agreed to plead guilty to all 14 criminal charges, admitting responsibility for the deaths of 11 people and the events that led to the largest environmental disaster in U.S. history. “It stands as a testament to the hard work of countless investigators, attorneys, support staff members, and other personnel – from the Deepwater Horizon Task Force and a range of federal, state, and local agencies – who have worked tirelessly to advance a complex and wide-ranging investigation that began even before the oil well was capped,” said Holder. BP will pay the criminal penalty in installments over a period of five years. Under the terms of the agreement, nearly $2.4 billion of the criminal recovery funds will go towards environmental restoration, preservation, and conservation efforts throughout the Gulf coast region, including barrier-island creation and river diversion projects in Louisiana. The $2.394 billion will go to the National Fish and Wildlife Foundation, an independent nonprofit conservation group chartered by Congress, which will oversee use of the funds to maximize benefits for fish and wildlife habitats along Gulf Coast. An additional $350 million will be used to develop state-of-the art oil spill prevention and response technologies, education, research, and training. And more than $1 billion will go to the U.S. Coast Guard’s Oil Spill Liability Trust Fund, to be available for cleanup and compensation for those affected by oil spills in the Gulf and throughout the United States. In addition, the agreement resolves all securities claims with the Securities and Exchange Commission with a $525 million penalty paid in installments over a period of three years. As part of its guilty plea, BP will retain for four years a monitor who will oversee safety, risk management and equipment maintenance in relation to deepwater drilling in the Gulf, as well as an independent auditor who will conduct annual reviews to ensure compliance with the terms of this agreement. “The company will also hire an ethics monitor to improve its code of conduct and foster robust cooperation with the government,” said Holder. Bob Dudley, BP Group chief executive, apologized and expressed contrition for the disastrous spill that spewed oil into the Gulf for three months, fouling the coastlines of five states and closing most of the Gulf to fishing for months. But the Justice Department’s investigation is not over, said Holder, and while the criminal charges against the company were settled by today’s agreement, criminal charges against individuals as well as civil charges are expected. Holder said that in addition to the charges filed against BP, a federal grand jury returned an indictment charging the two highest-ranking BP supervisors who were on board the Deepwater Horizon on the day of the explosion with 23 criminal counts – including 11 counts of seaman’s manslaughter, 11 counts of involuntary manslaughter, and alleged violations of the Clean Water Act. The grand jury also charged a former BP executive – who served as a deputy incident commander and BP’s second-highest ranking representative at Unified Command during the spill response – with hiding information from Congress and allegedly lying to law enforcement officials. Today’s settlement will increase BP’s existing $38.1 billion charge against income related to the Deepwater Horizon spill to increase by approximately $3.85 billion. “Though we have been unable to date to resolve the civil case, we remain as determined as ever to hold those responsible accountable,” Holder said. “The deadly explosion and sinking of the Deepwater Horizon oil rig, which killed eleven workers and spewed five million barrels of crude oil into the Gulf, was no accident. 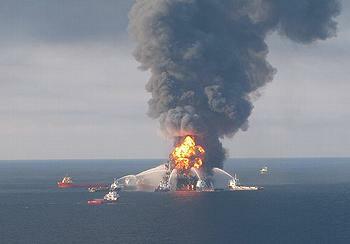 It was the result of criminal negligence by BP,” Brune said.